When you're tasked with introducing a little structure and discipline to a well-to-do household that's been hijacked by a couple of lovable scamps, you're going to need all the help you can get. 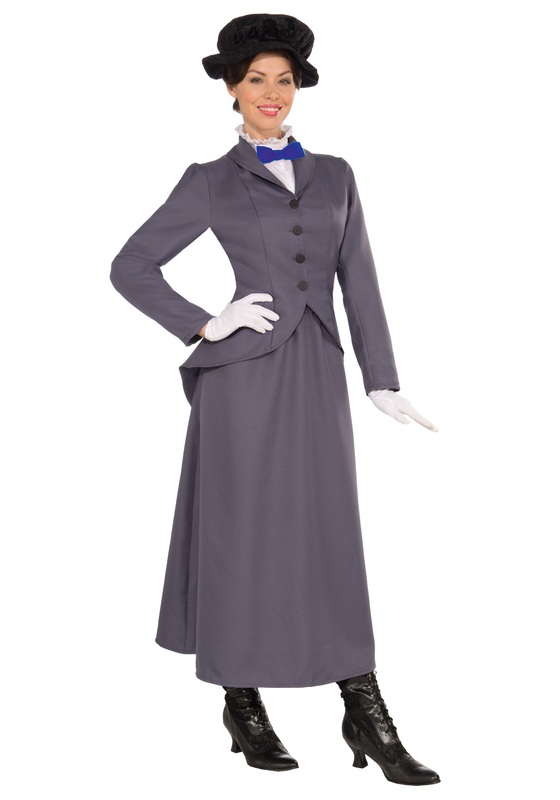 That's why we offer this English Nanny Costume, which is severe enough to convince the stern head of the household that you're up to the challenge, but includes a couple of playful touches that hint at some of the magical, musical fun in store for the children! Once you've nailed the job interview, you'll have to get down to brass tacks for a while. Make sure that you really lay down the law before loosening your grip on the reins—it'll make the kids even more appreciative of your fun side! A good cop, bad cop routine with a chimneysweep pal is a great way to show them that there's a time and a place for everything, including high-kicking, footstomping rooftop dance numbers. And there's nothing like a well-timed spot of genuine magic to keep up their spirits! We know that every nanny has a different bag of tricks, so this outfit sticks to the essentials: a businesslike gray jacket and suit that are practically standard-issue, along with a puffy black hat and a cheery blue bow tie that soften the look to practical perfection. Add your own deceptively-capacious carpetbag or talking parrot umbrella if you want to leave an extra-memorable impression! And feel free to come back again for a visit any time the weather permits!